Fifth-placed Daryl Gurney is three points behind fourth-placed Gary Anderson in the league table and needs to win this match to keep his play-off hopes alive. Even if Gurney does win, it might not be enough depending on how Anderson and Cross fare in their games later in the evening. Gurney has lost just two of his last ten Premier League matches, and last Thursday evening in Manchester he earned a very creditable 6-6 draw against league leader Michael van Gerwen. His checkout percentage of 66.7% against Van Gerwen was his best of the tournament so far, showing further proof of his improved finishing during the Premier League season; over his last eight matches, his overall checkout percentage is over 50%. Michael Smith has all but confirmed his place at London's O2 on May 17 for finals night. He is four points ahead of fifth-placed Daryl Gurney in the table and needs just three legs to guarantee his qualification. Last week in Manchester he was involved in a 7-1 win against Peter Wright and a 7-1 defeat against Michael van Gerwen. His match average of 104.9 during his win over Wright was his highest average of the 2018 Premier League so far. Missed doubles proved very costly for Smith in his defeat to Van Gerwen, as he hit only one of his nine attempts giving him a checkout percentage of 11.1% - his lowest checkout percentage of the Premier League season. Daryl Gurney might come up short in his bid to make the play-offs but he isn’t giving up without a fight and he can take many positives from his debut Premier League campaign. The Northern Irishman has been competitive throughout and will be determined to finish as high as possible in the table. 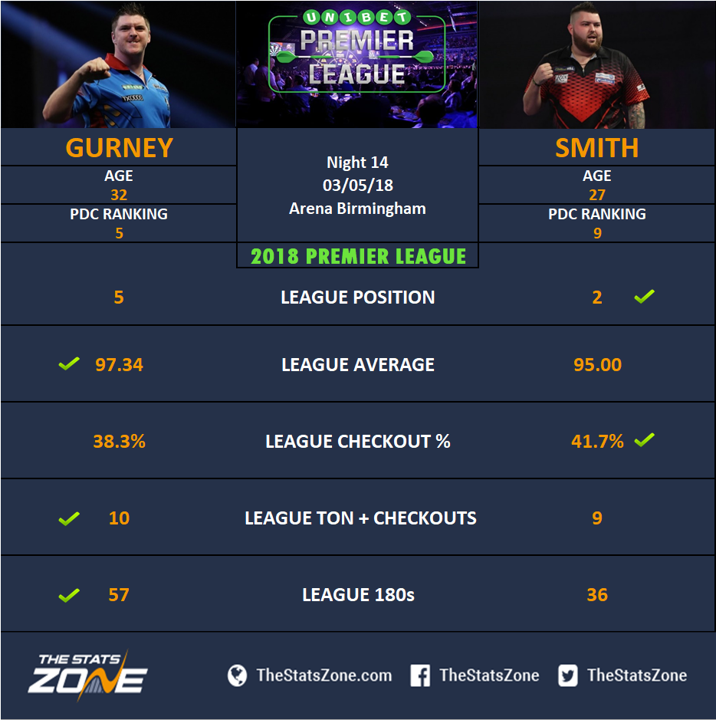 Gurney has arguably performed to a higher level than Smith during the season, though Smith has produced bursts of good timing that has led to some excellent results that will surely see him take a top four spot. When they met back on night two of the 2018 Premier League, Michael Smith took advantage of some wayward finishing from Gurney to win 7-4. Gurney is much more proficient on the doubles now though and is not likely to let as many chances slip but he will still find a relaxed and confident Smith a very tough nut to crack. This could be a very watchable and entertaining encounter that ends in a 6-6 draw.